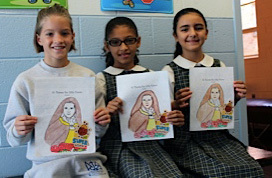 Today, Fourth grade students learned about Saint Theresa the Little Flower. They are preparing for their saint project that will be due on All Saint’s day, November First. On that day, they will present a poster to the class with all their research about the saint they picked. Look back again, to see some of their work that will be posted to our website.